While reading through Crochet Adorned by Linda Permann (don’t forget to enter to win a free copy!) a lacey bowl project caught my eye. The book has full instructions on how to crochet your own doily and a recipe for a sugar starch to make your flaccid doily hard as a rock. Always one to take the easy way out I thought to myself: now why couldn’t I take pre-existing doilies and some Fabric Stiffener and do the same thing? Better yet I could toss in some Fabric Paint and make white doilies any color that I wanted. I actually made two bowls. 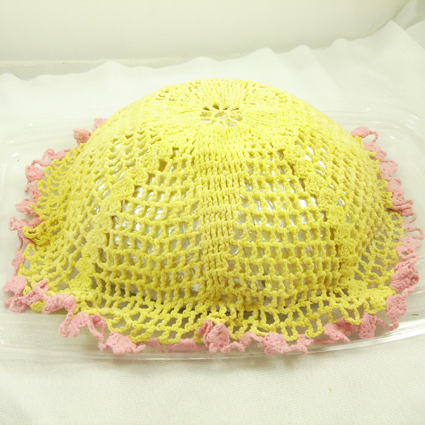 The first one using a vintage yellow doily with pink trim. First I found the perfect bowl to use as my mold, which just so happened to be one of my salad bowls. Not wanting to get glue all over something I eat from I wrapped the bowl in foil. Plastic wrap would have worked as well. 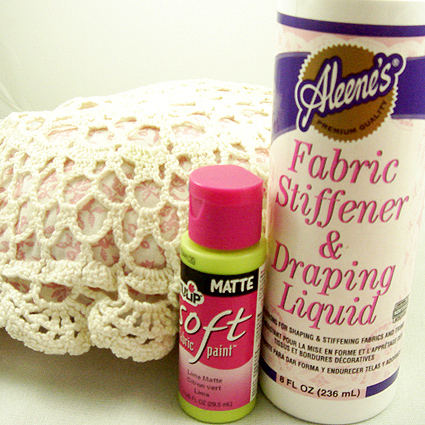 Next following the instructions on the bottle I put on my rubber gloves and completely saturated the doily in Aleene’s Fabric Stiffener & Draping Liquid. 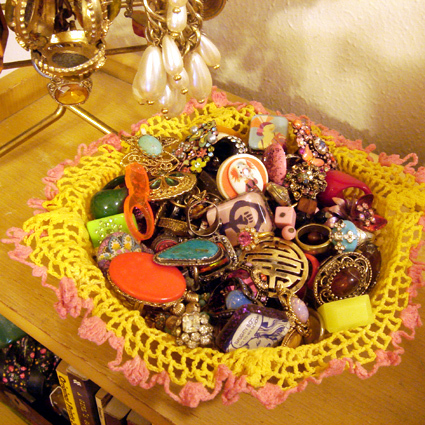 I then draped the doily over my bowl and allowed to dry overnight. 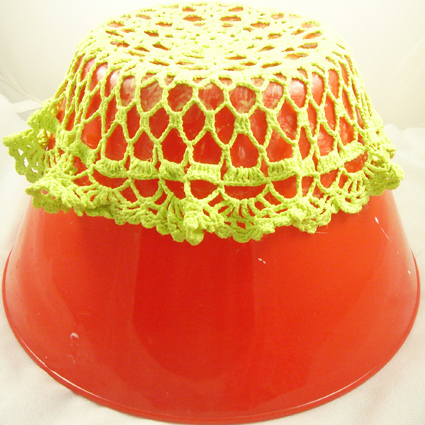 The next day I gently peeled my crocheted dish away from foil wrapped salad bowl. I was surprised by how stiff the bowl was. It was strong enough to hold all of my rings, and that is a lot of rings. 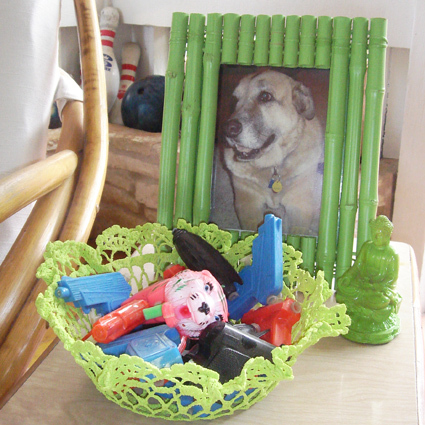 For the second bowl I snagged a white doily from a pillow, dyed it green and gave my vintage water gun collection a new home. First using a seam ripper I removed the doily from the pillow. 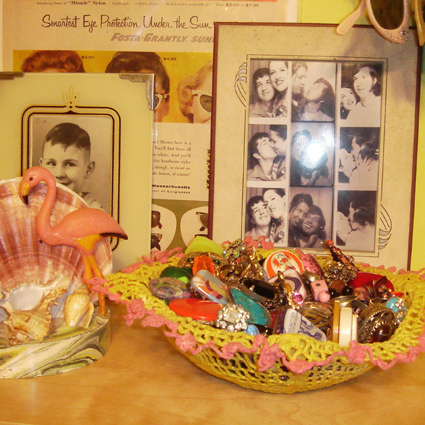 Doilies are readily available at thrift stores and most craft stores carry them as well. Unlike the other bowl where I just saturated the doilie in Aleene’s Fabric Stiffner & Draping Liquid I also added a squirt of Tulip Soft Fabric Paint in to match the color of the walls in my game room. They have so many colors to choose from you could make your bowl match any room. 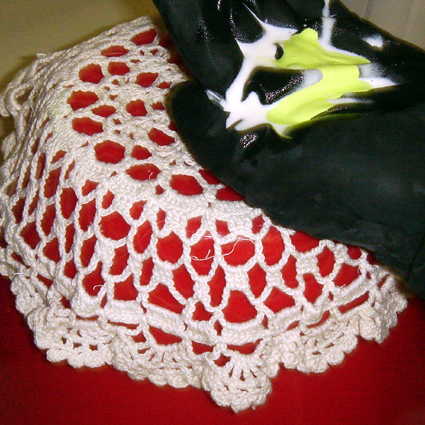 I then coated my doily until the fabric was saturated and the color was even. I used a large bowl as my mold and draped my doily over the bottom and allowed to dry overnight. Doilies come in all shapes and sizes so you can make any size bowl you want. 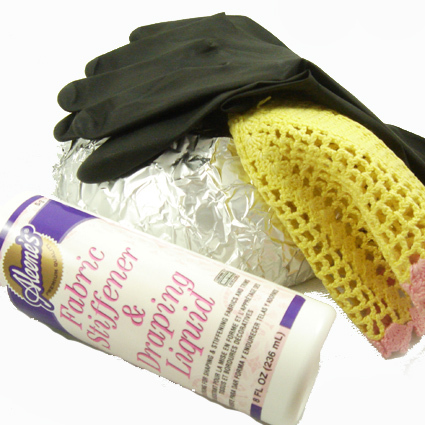 With the help of a little fabric paint you can also make them any color you want. Think of the possibilities: clocks, lamps and more oh my! 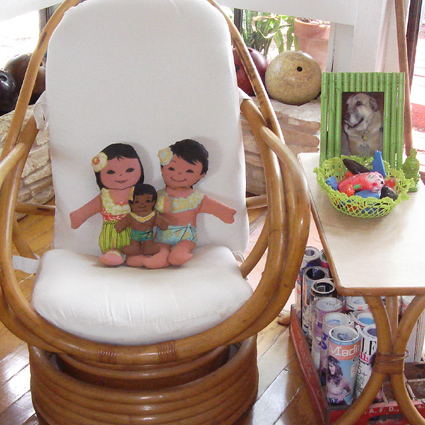 Posted August 20, 2009 & filed under I Love to Create, Needle Arts. so cute! i might try this with some of my grandma's old doilies! Adorable! I need to make one of these. you sold me, love it!!! Love it! Reminds me of those thread covered balloon eggs we made in grade school! That is way cute! I always see doilies at the thrift shops-yay for project time! Thanks for sharing, I'll be linking to this. Love this project. This was something my grandmother use to do. Gets me thinking about many other things I could shape… hmmm… Thanks for sharing. I've been working with doilies too. But in a different sort of way…. Awesome!!!!!!! !great idea… I need to make one of these….Thanks for sharing…. 1st…I am dying over your vintage watergun collection!! !,2nd…I MUST try this!!! Such utter fun! Thanks for the tutorial. Can't wait to try it with my doily stash. I love them, but never know what to do with them! I plan to share this on my blog on Friday, too. THANKS!! !